My 4-year-old identical twins started pre-K this year, in separate classrooms. I am naturally the kind of mother who does not sweat the small stuff. As one of my friends has said, “You’re just not built for anxiety,” but it does not make the anxiety others experience invisible to me. Actually, I need to take some of this back because I was nervous before my oldest daughter started kindergarten, but it was from the fear of feeling pressure to be overly involved in my kid’s school. It’s not something I actively try to avoid, but I certainly do not seek opportunities to volunteer or be a room parent. I declined being a room parent to my twins’ classes this year because I don’t have the desire or bandwidth. I did not have a great expectation of what pre-K would look like; I imagined much like full-time daycare. 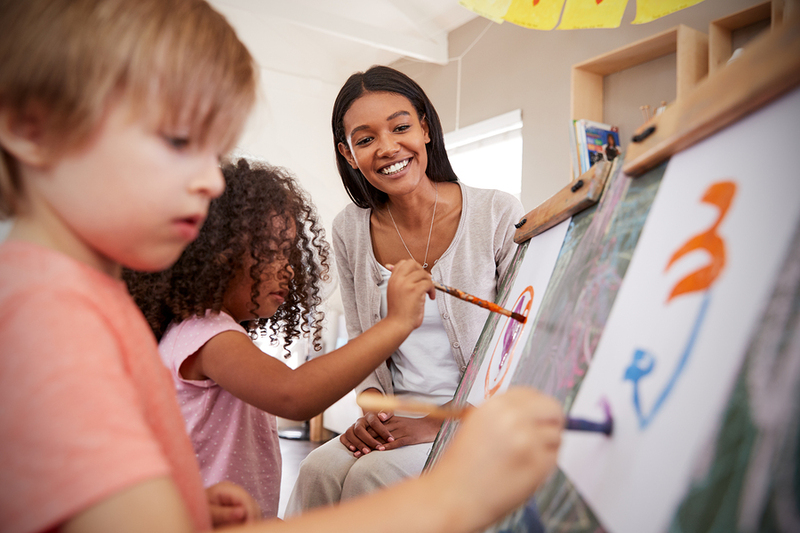 What I did not expect was the seemingly overwhelming concern from parents for their kids’ welfare while under the care of their pre-K teachers. So what I want to say to parents of pre-K children is: take a deep breath, our kids are totally fine. Everyone is OK. I know how triggering it feels when your very verbal kid tells you something bad happened to them at school. Let’s give it some perspective, though. When I tell my 4-year-old she can have two cookies instead of three for dessert, she goes off the rails. I am told I have never been meaner. I am not being their friend. I am being the worst… and it goes on. All this over a single cookie. Kids have a way of sharing information with truth in it, but from their very specific lens of life or death drama. I believe something happened (maybe a kid took their toy), and I think they truly believe everything they are telling me. Do I think they are telling me the whole truth? Ehhh, hardly. Still, I respond by validating their feelings, and then give them strategies and ways to cope with their upset. I coach them on what to do, which always starts with communication. I cannot fix the world for them, nor do I want to. Who has the time and energy?! Just the other day, I worked with one of my 4-year-olds on having a conversation with one of her teachers. We talked about the ways she can tell him when she’s feeling sad or upset and he will help her. It’s all about communication — and it was a positive experience. At the time, my mini-me was really nervous, shy, and scared to talk to her teacher. I get it; I think this may be the first time she had to have a more serious conversation with an adult who is an authority figure outside of me and her dad. But, my hope is that she will feel more comfortable having the conversation herself the next time something bothers her. She had a good experience, so it’ll reinforce communicating openly moving forward. My role as her mother is to provide options, not swoop in and try to take away the “ickiness.” Life will get hard and I trust my kids can handle it. I will guide them when needed. We cannot keep our kids in a bubble, but we can give our kids coping mechanisms and tools to navigate and find their own internal resilience. This speaks to being a helicopter versus free-range parent. I look to the teachers as the child experts because they have worked with this age group day in and day out for years and years. They have more experience with kids in this age range than I ever will. I have great trust and faith in the fact they know what they are doing. I am an expert in my kid, but it’s my job to teach them how to handle life… not protect them from life. Also, kids are incredibly resilient. So, let’s all take some deep breaths. Our kids are OK.
Ahh, I needed to read this! Thank you! So happy it helped you! Deep breaths, you got this. Your kid has this too! Everyone is fine.